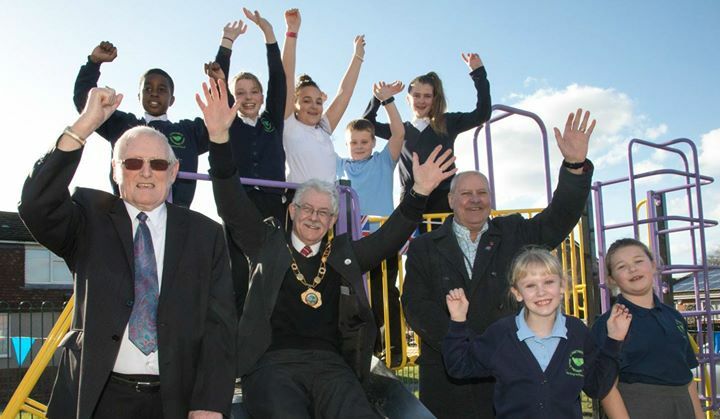 Local school children from the area helped choose the design for a new play park at the Donnington Lifelong Learning Centre as part of a scheme funded by SUEZ Communities Trust to the value of just over £21,000. The Let’s Play – Donnington Project for children aged under 12, now has one spacious play area after the central fence was removed to create a site with new equipment including a seesaw, spinning dish, swings and two multi-play climbing frames. As the only outdoor play equipment in the area, the park is vital in encouraging children to engage in fun physical outdoor activities. Telford & Wrekin Councillor John Minor Cabinet Member for Leisure, Green Spaces and Parks, said: “We’d like to thank all involved for the commitment to this cause including Suez Communities Trust for their financial assistance and who made a significant investment into these facilities. “As well as the Donnington Partnership, Donnington and Muxton Parish Council, St Matthews Primary School, Donnington Youth panel and Councillors Liz Clare and Clive Mason have actively been involved throughout the project. SUEZ Communities Trust (formerly SITA Trust) works closely with the Landfill Communities Fund (LCF) – a tax credit scheme that encourages landfill site operators to pass on funds to community and environmental projects through approved bodies such as councils. Shame people tend not to comment on your positive posts. But the negative ones get hundreds of comments. This will make a big difference to this community, it’s great!